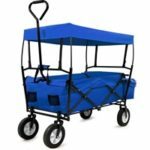 Wheel Diameter 10" 6" 10" 10" 6"
Wheel Diameter 13" 10" 6" 10" 6"
The multi-purpose garden trolley cart has many names including: Garden trolley, garden cart, garden wagon and dump cart. However it probably has more uses than names it’s referred to as, it is commonly used for gardening, construction sites, camping, festivals, market/trade shows and even family days out! Save your time, effort and even prevent potential injuries by investing in a garden trolley. Its four wheels and front handle which is also used to steer makes transporting goods and equipment simple. When you’re not using it, it can be stored away in a shed or big enough garden storage box. 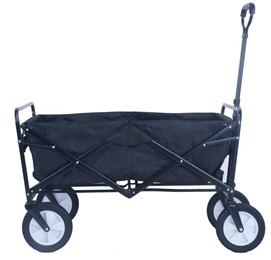 For those without a garden or limited space then consider a collapsible garden trolley cart. There are different types of garden trolley carts which are designed to be more suited for specific tasks. For instance, a tipping cart is more suitable for transporting and unloading soil, cement, mulch, coal etc. It’ll be a lot more time consuming if you had to unload those materials with a garden cart that’s not able to tip and dump the materials. 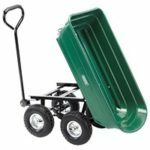 Another great alternative which is much better suited to gardening, DIY and construction (not for festivals) is the classic garden wheelbarrow. The wheelbarrows are ideal for light or heavy duty use, but if it’s to be used for light use, you can grab one for a very reasonable price! 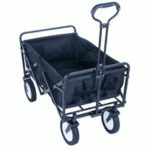 Before you start selecting the best garden trolley cart, you’ll need to decide on what you’ll be using it for, that’ll already rule out unsuitable models. Below are the features to take into account, which we’ll explain what to look out for. Maximum load capacity – Total weight that can be loaded onto the trolley. Some manufacturers will mention there’s also a maximum moving weight which is less than the maximum load capacity. So to be on the safe side, try to go around 20% below the max capacity. 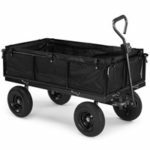 Dump capacity – This would only apply to garden tipper trolley, some models will have a lower dump capacity than loading capacity. 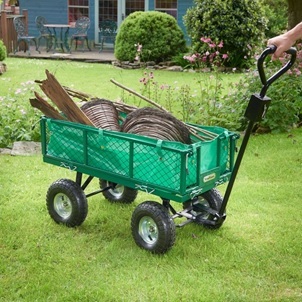 Tipper – Whether the garden cart is able to tip the container to unload the contents easier. 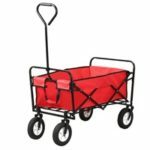 Fold down sides – Usually only the heavy duty garden trolley carts will have the option of being able to fold the sides down. Fold down sides makes it easier to load and unload items onto the cart. Sides can also be left down if you’re transporting larger items that won’t fit with the sides up. Material – Frame and container will be constructed from strong material to withstand heavy loads, however collapsible garden trolleys tend to have a weaker frame, hence why it has a lower max load. Container dimensions – Check the container dimensions against certain items that’ll need to be transported on the cart. If the item is too big then it won’t sit in the container properly and can risk falling out during transit, this is more important for fragile items. Wheel type – Tyres can either be pneumatic or rubber, the former is filled with air and can handle uneven terrain better, however it’s also susceptible to punctures. Whereas the latter can’t be punctured or deflated, but it doesn’t handle uneven terrain as well and the overall handling is not as smooth. 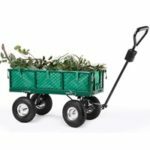 Unfortunately you can’t really choose what type of wheels you want, as the type of garden trolley cart you choose will already have a specific type of wheels. Wheel diameter – Larger wheels are better for handling and uneven surfaces. Trolley carts are commonly used for music festivals. It is used to transport your tent, sleeping bag, wellie boots, picnic basket set and other essentials. Since you don’t need something that has a high load capacity, a folding festival trolley is perfect for festivals and it can be stored away when not in use, only taking minimal space. 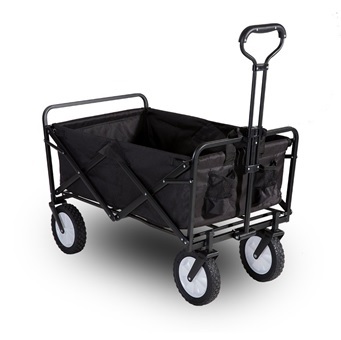 Higher maximum load capacity than other folding festival trolleys. Gives you that extra bit of weight allowance which means it’ll be sturdier. Has a pouch on the front of the cart to put smaller items such as your phone, camera, bottle of water etc. Includes a bag to cover it when it’s not in use. Dimensions: 94 x 47 x 20cm. Has a capacity of 75 litres, or alternatively, 250kg when load is stationary or 180kg when load is being dumped with the easy release one move tipping function. Strong plastic tub can support lots and heavy duty, powder coated steel frame will aid too. Four big 10” pneumatic wheels – the two front ones are the ones which maneuver the trolley. Towing hitch leads to 78cm push or pull handle bar. Self-assembly necessary and also includes a two year warranty. Very difficult to assemble, especially if solo. 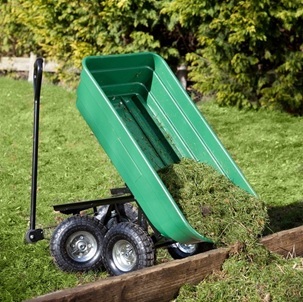 This garden tipping cart can transport 75 litres or 250 kg of a wide variety of stuff, which can be tipped out, thanks to the tipping mechanism. 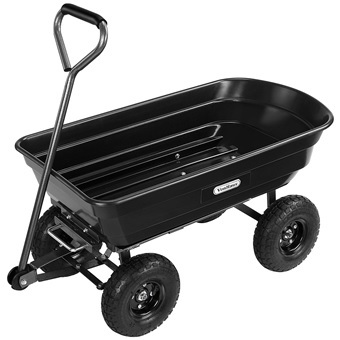 The plastic tub and heavy duty, powder coated steel frame are both sturdy and will definitely not disappoint. There are four large 10” pneumatic wheels and a long push or pull handle bar for you to use to guide the trolley. To put the cherry on top, this trolley is backed by a two year warranty, in case anything goes wrong. Dimensions: 80 x 44 x 25cm. Can carry up to 150kg in the durable nylon fabric tub. Can be collapsed and folded into a portable bag, deeming it as space-saving. Steel frame is sturdy and tubular and the handle is padded for grip. Four 6” solid rubber wheels, which can support your load with ease. Shipped from a UK-based warehouse, so will be dispatched and delivered to your doorstep quickly. Wheels, being made of rubber, get stuck from time to time. 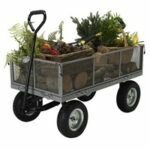 Perhaps space is the thing you search for when looking for garden trolleys – well, this folding garden trolley does just the trick! Made of nylon fabric and a tubular steel frame, it is capable of folding, as well as carrying up to 150kg. Because of its portability, it’s ideal as a pull along cart for festivals. When not in use, it can be folded into a portable bag. Additionally (if you live in the United Kingdom, this will come as a great plus), this cart is shipped from a UK-based warehouse, so it is likely to be delivered quickly to you. Dimensions: 85 x 45 x 23cm. 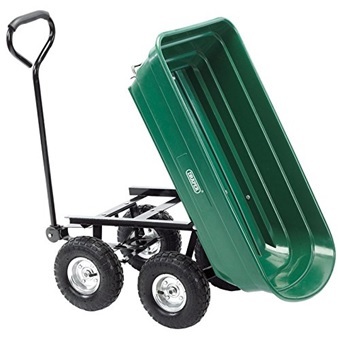 Capable of carrying 350kg, which can be loaded on and off easier, thanks to the sides that can fold down. The long handle will help you steer the trolley with ease. Pneumatic tires can handle a wide range of terrains. Includes a two year warranty. Has a very bad stench, which may or may not wear off after some time. 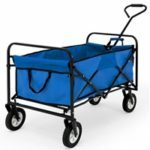 Easily load on or load off any heavy items onto this trolley by folding down the sides. The long handle will let you steer your load with ease, whether there be 350kg or 1kg. Even better, the pneumatic tires can tackle many terrain. Oh, and don’t forget about the included two year warranty. Dimensions: 94 x 51 x 20cm. Can carry upto 200kg or 75 litres of anything you wish. Tip the bucket or lock it into place, whenever it suits you. When you tip the bucket, the wheels are drawn together, but when the bucket returns to its place, the wheels spread again – all for balance! 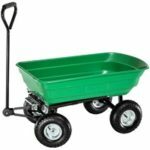 Heavy duty pneumatic wheels and lightweight, sturdy steel frame. Requires many tools to assemble and the tools aren’t included. Tipping carts are a lifesaver sometimes, especially when you have a rather heavy load. Maximum load you can load onto this specific cart is 200kg or 75 litres, which is perfect for light to medium chores. The heavy duty pneumatic wheels aid you in tipping – when the bucket is being tipped, the wheels will be drawn together, but when the bucket is back into place, the wheels will return to its wide formation. It really is quite a handy mechanism. Dimensions: 82.5 x 52 x 25cm. Capable of carrying 70kg, thanks to the coated, strong steel frame. Polyester lining is durable and can battle all weathers. When not in use, you can easily fold and store it. Wheels are prone to breaking or falling off. This folding garden trolley can also brave festivals! It can carry up to 70kg, with the help of the sturdy steel frame. The polyester lining is durable, as well as weatherproof, so you don’t have to worry about it so much in the rain. When you’re not using it, you can fold it up and store it somewhere safe.